The flattest folding adapter in its class and one of the lightest travel adapters at 17.4 mm thin and 50 grams light! ULTRA PORTABILITY: The flattest folding adapter in its class and one of the lightest travel adapters at 17.4 mm thin and 50 grams light! WORRY-FREE: works with US, UK, EU, China, Australia, Africa, and many more! 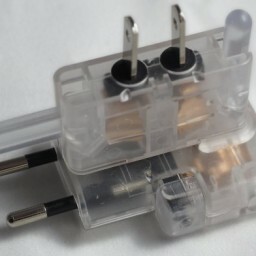 Conforms to CE and RoHS standards. 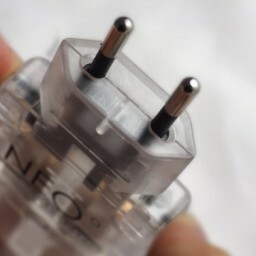 Input voltage ranges from 100 V - 250 V at 6 A - AC Rated at 110 V - 660 W/250 V - 1500 W.
FORM MEETS FUNCTION: Unique design transforms flat to free up space in your luggage while providing compatibility in 150 countries! Compact and gets the job done. GIFT READY: Set arrives packaged in a clear case window to protect and display the adapter. SATISFACTION GUARANTEED: backed by a one-year warranty to be free from manufacturing defect. 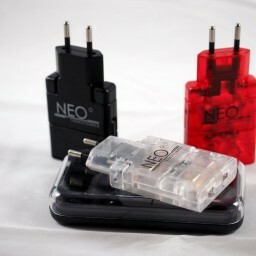 The NEO Transformer is made of new fire-resistant, durable, environmental Polycarbonate. 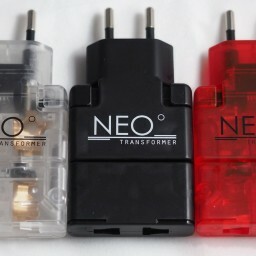 Ikris Design - NEO Transformer Travel Adapter SOOOOO EXCITING!